The Burst! 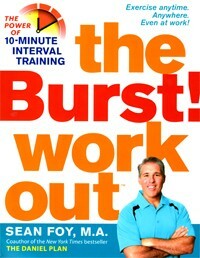 Workout builds upon Sean Foy's 2009 book The 10-Minute Total Body Breakthrough. • Recommended for: anyone who wants to improve their health and/or fitness, but not spend more than 10 minutes doing so! Sean Foy, MA obtained a BS in exercise physiology and a master's degree in marriage and family counseling. He worked as a personal trainer for 5 years before launching his company Personally Fit. Currently, he is the president and founder of the Personal Wellness Corporation, a consulting firm that provides health and fitness training to hospitals, Fortune 500 corporations, and other organizations. He lives in Placentia, CA. Chapter 1: It's About Time! Chapter 5: Level I: Now You're Moving! As a fitness consultant, Foy found that many people were just too busy to devote an hour out of each day to working out. And, even if they could, often, they lost motivation. He created a program that people could do anywhere...ie., at home or even at work. A total of 10 minutes...yes, really! In this book, Foy suggests a 12-week program, divided into 3 intensity levels. Chapters 5, 6, and 7 walk you through them. If you are not very fit, you would start at Level I. Here, you would do the 4-3-2-1 program on Mondays, Wednesdays, and Fridays, and do some other physical activity on the rest of the days each week for 10 minutes per day. On the one hand, with so many people who are completely sedentary all day long, doing anything -- even a couple minutes of exercise -- is a good thing! At the very least, because I'm a health/medical professional, I wanted to know if such an abbreviated work-out, besides being more "satisfying" than longer sessions, actually improves specific health and fitness parameters. Though The Burst! Workout isn't intended to be a scientifically-written book, because Foy's program differs so drastically from the current "official" exercise recommendations such as those from the American College of Sports Medicine and the National Physical Activity Plan, it's reasonable to expect that some evidence be presented to back up this program. Indeed, on page 10, Foy states his program is "scientifically validated" to achieve improvements in fitness. On page 13, Foy states that he has reviewed "mountains of scientific research." He briefly summarizes relevant research on short-duration, high-intensity exercise in Chapter 3: "The Science Behind 4-3-2-1." The details are presented in conversational style, which is appropriate for a consumer-friendly book such as this. While he does sometimes mention the names of the researchers, or, where the research was conducted, the book does not provide any bibliography. This makes it difficult to go back and read the original papers without doing some digging. The research Foy refers to is relevant, however, he presents very little documentation that his 4-3-2-1 program actually achieves real health and/or fitness improvements. After 12 weeks, the twin who followed the conventional approach lost 5 lbs and felt hungry and much less fulfilled. The other sister exercised a total of only 70 minutes per week but lost 14 lbs. In addition, she felt great and never felt hungry. Without being too pickey regarding health/medical research, these results are worth noting. Still, it would be more impressive if Foy would document specific results in some of his clients: ie., after (X) number of weeks, what were the changes in not only body weight, but, also, aerobic fitness level, resting HR, blood pressure, fasting blood glucose, BMI, waist circumference? • Photos & Illustrations: There are lots of black-and-white photos of fit-looking individuals demonstrating the various exercises presented in Chapters 5, 6, and 7. There are 1-3 photos for each exercise. Generally, these are well done, however, adding some directional arrows would make them even more user-friendly. • Tables & Graphs: The tables are generally done well. This book does not contain any graphs. • Documentation / Accuracy: This is not a scientific book. Though the author does summarize clinical research, he does not provide any bibliography at the end of the book. What I Liked About This Book: The Burst! Workout presents a new concept in exercise. In doing so, it gives people not only a new option, but, might also improve long-term adherence to exercise, something that many people struggle with. Chapter 4 covers motivation well; this section could apply to other areas of a person's life, not just their exercise program. Also in Chapter 4, Foy does a nice job of presenting how to assess fitness parameters. What Could Be Better: I would have preferred that Foy presented more details on the effectiveness of this program...ie., how does it affect specific health and fitness measurements? Also, there is no discussion of how a person can (and should!) use their resting heart rate to monitor both their aerobic fitness and their cardiovascular health. Chapters 5, 6, and 7 could be improved. These pages are busy; my eye was bouncing all over the place. As I looked through these pages, initially I wasn't sure if I was supposed to do all of the exercises, or, pick and choose from different options. These 3 chapters could be simplified by using less text and limiting each exercise to one page. This would place the title of each exercise at the top of the page. In summary, I think The Burst! Workout is a worthwhile book to add to your personal library. It provides a nice collection of really simple exercises you can do almost anywhere.